Will be top-down, but with more depth and light than Sunless Sea. 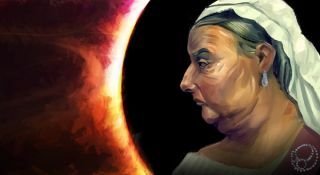 Sunless Skies will be at the PC Gamer Weekender next month, a couple of weeks after its long-teased Kickstarter is set to go live (on February 1st). We'll know a lot more about Failbetter's promising Sunless Sea...quel come February, then, but before that, we'll have to make do with the occasional dribble of new info from the official blog. Failbetter's Paul Arendt goes into great detail on each of those points in the linked post, and you should read the whole thing if you're interested in the game. The main takeaways are that Skies, like its predecessor, will be top-down, but with parallax scrolling to give a greater sense of depth. The technology will be plausible—despite being Victorians in space—and built on the sort of thing that was available at the end of the 19th century. It's space trains rather than spaceships, essentially, and that's ace. Obviously. Sunless Skies' vision of outer space will be "busy and stuffed with life—the antithesis of a traditional space game. And for the sake of easy navigation and to improve variety we wanted each region of the Wilderness to have its own distinctive colour palette, which is a bit tricky if it’s dark all the time. So instead of being filled with unrelenting darkness, the Wilderness is a place of winds, mist and fog". Misty fog is just as good at hiding 'orrible monsters, however, so don't expect the world to be short of toothy surprises. "So we have a number of elements," the post wraps up, "locomotive technology, fog, organic and Art Nouveau shapes, parallax, and painterly roughness. Each addresses one or more points on our list of requirements. They should work together harmoniously, and not distract the player from the important business of exploring the outer reaches of space and scaring themselves silly. That’s the plan, anyway."